Wizards owner Ted Leonsis assures us fans that they have a plan and that they’re sticking to it. However, I think The Plan is a lot messier than it seems to be on the surface — and I don’t think it includes a clear and realistic path to building a championship contender. The recent transactions by the Wizards (the Marcin Gortat trade, declining the fourth year options of Jan Vesely and Chris Singleton) will give them $15 million in cap space in the summer of 2014, making them major players in free agency. That exact amount also depends on what they choose to do with Gortat. While all the sorcery in the world won’t bring LeBron, Carmelo or Bosh to the nation’s capital, a playoff run this year will make this squad more of a draw for lower tier free agents. After a half decade of basement-dwelling drudgery, the Wiz faithful finally have reason for optimism. But how much optimism is warranted? 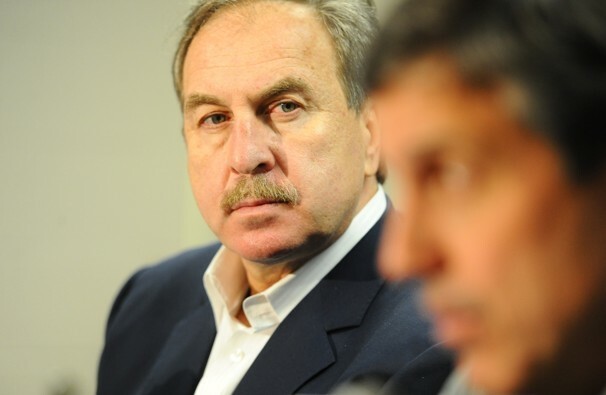 The Wizards could indeed have $15 million (or even a little more) in cap room next offseason. All they have to do is renounce Gortat, Ariza, Trevor Booker, Jan Vesely, Kevin Seraphin and Chris Singleton. The last three don’t matter much. They’re bad NBA players and will be gone after the season. If the Wizards are to make a playoff run this season, Gortat and Ariza will be major contributors, and Booker is likely to be at least a significant part of the rotation. A Wizards “get into the playoffs” rotation is probably going to include Wall and Eric Maynor as the PGs, Beal and Martell Webster or Garrett Temple as the SGs, Ariza and Webster as the SFs (with a possible contribution from Porter), Nene, Booker and Harrington at PF, and Gortat and Nene at center. It’s at this point that the “logic” of the whole getting into the playoffs will make the Wizards more attractive to free agents part of The Plan breaks down. If the Wizards sign a significant free agent next offseason, that free agent cannot be addition. Since the team can’t have cap space unless it’s willing to give up Gortat, Ariza, Booker, etc., any free agent signing will be replacement of those players. In effect, they’ll be trading the departed players for the new guy. So, put yourself in the mind of a “brand name” free agent. If you’re interested in playing for a winner, why would you pick the Wizards? The group that “won” (meaning they got into the playoffs) can’t be kept together if the team decides to sign you. Key contributors would have to be let go — guys without whom Washington would have missed the postseason. In other words, a potential free agent can’t go to the Wizards to “join” a winning team — he has to take the place of important contributors and hope that what he has to offer plus the continued development of the team’s remaining players is enough to do more than keep the team treading water. I don’t see how that package would be attractive to a prominent free agent who wants to compete for a championship. The Wizards’ cap situation provides some flexibility, which is a positive. If the salary cap rises to $62 million (which is what’s expected), Washington could clear as much as $16 million in cap space. That sounds like a lot, but when the cap increases, maximum salaries increase as well. That $16 million would be sufficient to pay a maximum salary to a player with 0-6 years of experience, but would fall short for players with 7-9 years or 10+ years. If the Wizards decide to let everyone leave so they can sign Chris Bosh, they’ll either need to convince Bosh to take a starting salary $4.2 million less than the maximum he could receive — and $4.5 million less than he’s due to receive under his current contract — OR work a sign and trade with Miami OR trade away other players (like Beal or Porter) to clear additional cap space. Let’s say they go after Detroit’s Greg Monroe instead. Monroe would have to take slightly less money (about $2.6 million over the four years of a maximum contract), AND Detroit would have to decide not to match. But let’s say all that happens. At that point, the Wizards would have eight players under contract and about $2 million in cap space to fill the rest of their roster — and they’d be working without a first round pick, which they traded to get Gortat. Who, in this scenario, would be playing elsewhere next season. Which means, the team would continue to lack depth, especially up front where they’d be reliant on Monroe, an aging Nene and whatever they could get from the second round or the free agent “remnants” bin. The question really comes down to this: What goals does the front office really have? If the Wizards are serious about contending for a championship with this group, the path to contender status is heavily reliant on player development and hoping to get lucky in free agency or the draft. If their goal is to make the playoffs and then see if they can go on a lucky run, they’re probably setting themselves up to make moves that will keep them treading water. All that said, the team could still become a title contender if some combination of Wall, Beal or Porter develop into true franchise players. The front office has already committed to Wall as its franchise bedrock with the absolute maximum contract they could give him. Wall hasn’t shown to be worth that kind of money yet, though his breakthrough may be coming. Beal’s rookie season was a lot like Ray Allen’s, a guy who will be in the Hall of Fame, but wasn’t a true franchise player. Porter, of course, is a question mark — his hip injury has kept him on the sidelines. As a college prospect, he graded as a good-but-not-great prospect. I’m definitely not saying the team is going to stink. They have sufficient resources to be a perennial playoff team for the next few seasons. That path to being a title contender is less clear, however. The two major trades the past couple years (acquiring Okafor and Ariza; then trading Okafor and a first for Gortat) don’t really look like the moves a team aspiring to win a championship in the near future would make. They seem more like the moves of a team content to make the playoffs in the short term, but without a genuine plan to transition from playoff contender to championship contender. My expectation for the 2014 offseason is that the team will essentially punt on free agency. My guess: they’ll re-sign Gortat and Ariza to four-year contracts in the name of continuity, and use the MLE to add frontcourt depth rather than taking a plunge in the free agent waters. Then they’ll hope that development from Wall, Beal and Porter will be enough to make them title contenders before age and injury wear down their 30-plus year olds up front. It’s not the way I would have done it, but there’s at least a chance it could work.